Last week I had the privilege of riding along with my friend Ron Wicker to get a taste of what I call the “infrastructure” part of harvest. As avid readers of this blog know, Ron runs a vineyard management company, and also makes his own wines in relatively small quantities. So, more than most people, Ron has hands-on knowledge of the many steps involved in getting grapes from the vine to the bottle. While I have a fair amount of knowledge about what goes on in the vineyard and at the winery, I knew that there is a whole logistical process involved in getting the fruit from the vines to the crushpad. This is what I wanted to learn about first-hand. What impressed me was the amount of logistics, pre-planning, and thinking-on-your-feet that go into making harvest work. You’ll see what I mean as I recount the day. 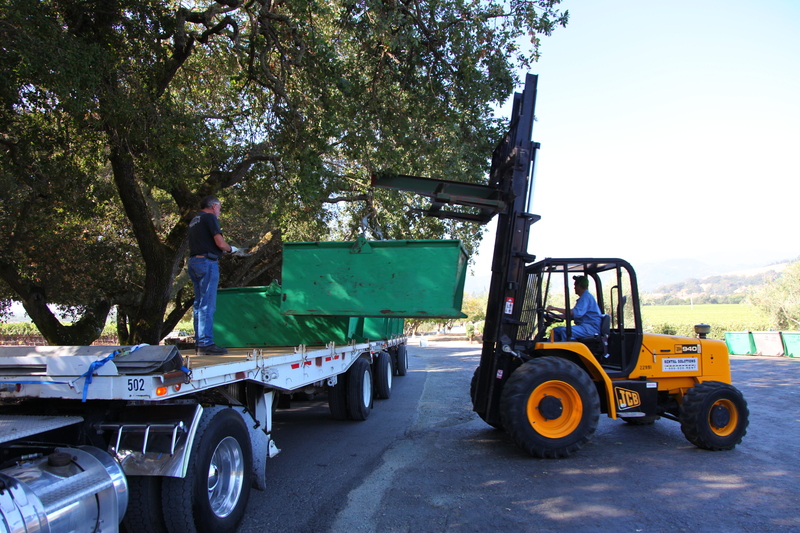 Last Tuesday Ron was hauling fruit and bins for one of his clients, the well-known Clos Du Val winery in the Stag’s Leap District on the Silverado Trail. While CDV has a lot of fruit right there on the Trail, they also own vineyards in Carneros, where they source Chardonnay and Pinot Noir fruit. I met Ron at 6am at the vineyards out on Old Sonoma road, not too far from my house. As I drove through the area, I could see the bright lights in the vineyards where other growers were busy harvesting fruit. 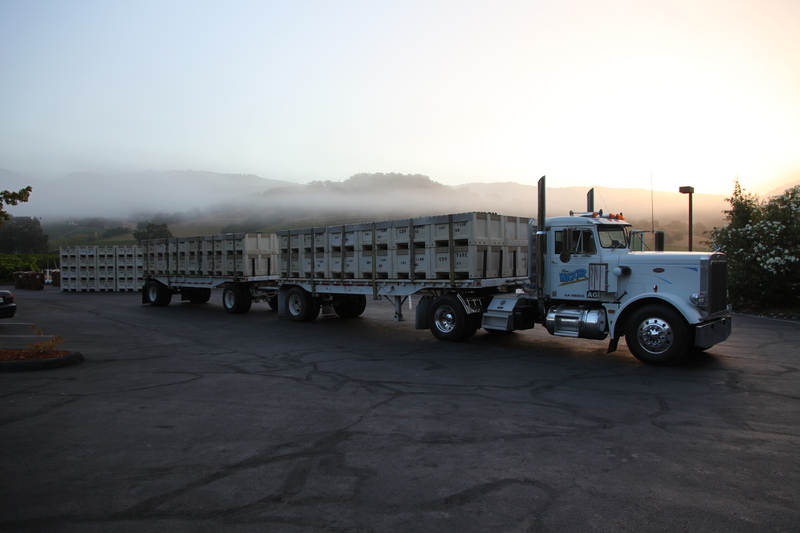 When I pulled into the vineyard parking lot, Ron was right behind me in his Peterbilt rig, and he quickly backed it up to the double-trailer that was already stacked with bins full of Pinot Noir grapes. I grabbed my coffee, camera and tripod and joined him. Ron had left this trailers positioned here the day before, with 48 empty “macro bins” for grapes. These bins each hold a half-ton or more of fruit (you don’t want to fill them too full or the grapes start to suffer under their own weight.) 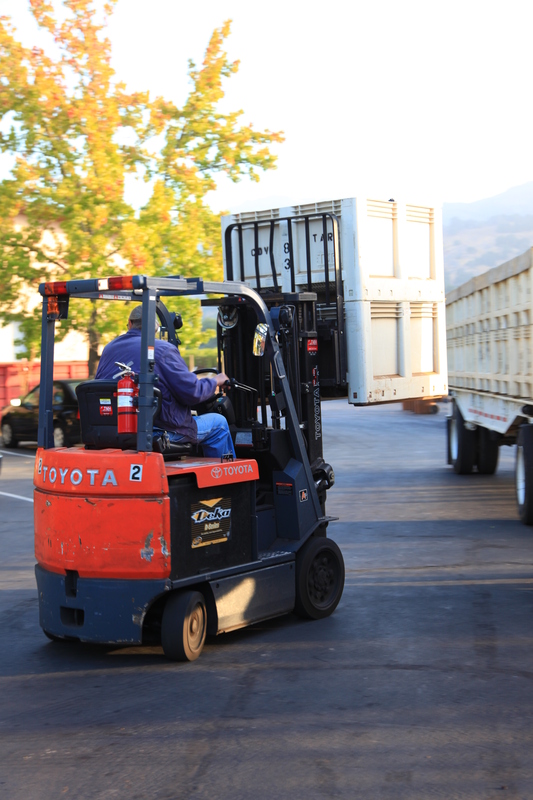 The CDV crew picked grapes all night (it is always preferable to pick under the cool nighttime conditions so the fruit stays crisp and does not get mushy) and then used forklifts to stack the bins on the trailers. All Ron had to do was strap down the bins using heavy-duty straps and aluminum “v-boards.” I snapped photos as he did that. Soon I met Al Wagner, who is head of vineyard operations for Clos Du Val. It was the first of several times I saw Al that day, as he seemed to show up in his truck everywhere we were as he made his rounds at all the different CDV properties. He gave Ron paperwork noting that we had 25 tons of grapes on board. He and Ron also discussed how many bins Al would need for the next day’s harvest. It is part of Al’s job to know how many pounds of fruit he has in each block of grapes to be picked, and to plan for its transport. He did a little math and asked Ron to bring 72 bins back to Carneros later in the day. Interesting fog bands as we head up the Trail. We finished strapping down the fruit and then fired up the 1972 Peterbilt and headed up the valley. However, given the length and weight (Ron estimated the total weight of truck, trailer and fruit to be about 80,000 pounds) of our rig, we weren’t about to take the most direct route to the winery. We had to stay on the major highways, and take advantage of wide turning radiuses. Clearly, we weren’t going across the tight little bridge on Oak Knoll Avenue. 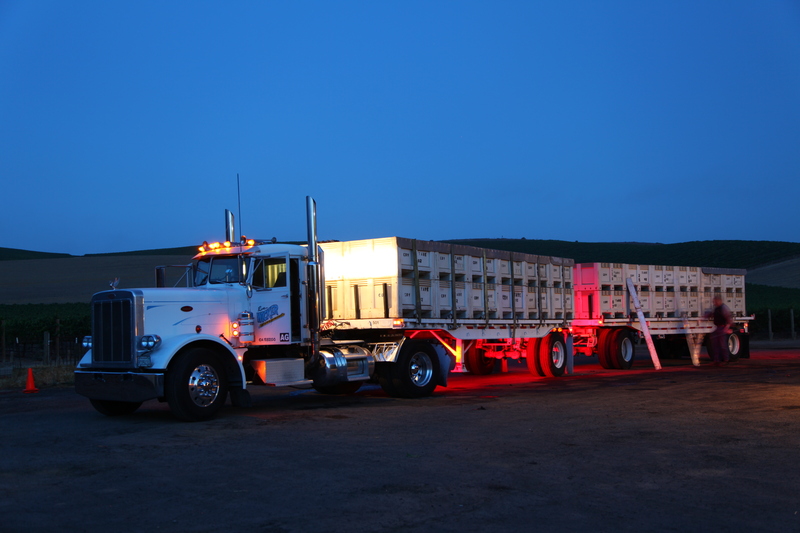 I had never ridden in a big-rig before, and it was an eye-opening experience. 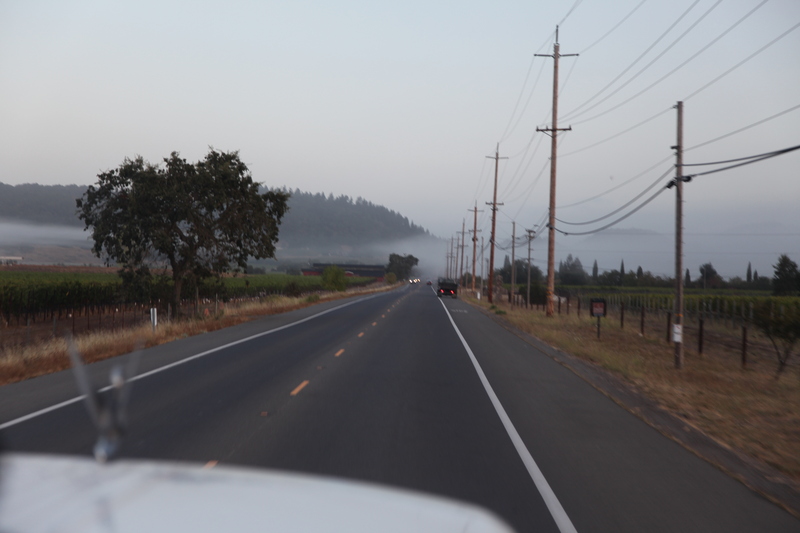 Not only does one feel every bump and pothole on the roads (and boy, does Napa have a lot of them! ), but you also really notice the driving behaviors of everyone around you. Suffice to say I have a newfound appreciation and respect for the truck drivers that I share the road with every day. At Clos Du Val as the sun comes up. things up. We made a wide, arcing pass through the crushpad area and pulled the trailers into the middle of the employee parking lot where they could be unloaded. Mike, the head of maintenance at the winery, was already outside to greet us. He was the only person we saw for a while, but soon other employees started arriving to start crushing and processing the grapes we had brought over. Mike took me to get some coffee, while Ron unstrapped the bins. Then Mike wielded the forklift and unloaded the 48 bins from the truck and lined them up along the crushpad area for processing. Al Wagner arrived in his truck and inspected the fruit in the bins we had brought over. He had heard there might be some botrytis on the grapes, and we found a few instances, but overall the Pinot fruit looked plump and juicy. The grapes I sampled were quite sweet and delicious. Mike unloads one ton of Pinot Noir grapes at a time. Once the full bins were off the truck, 48 empty bins were loaded back on and we strapped them down. Ron had decided on the fly that we would take 48 back over to the Carneros vineyard now, and the other 24 later. So, just as the CDV crew was starting to crush the fruit we brought over, we were headed back down Silverado Trail and through town to drop off empty bins for the next day. By this time, it was about 9am and traffic was heavy. Maneuvering a double-trailer through the center of town during commute time is no easy feat. 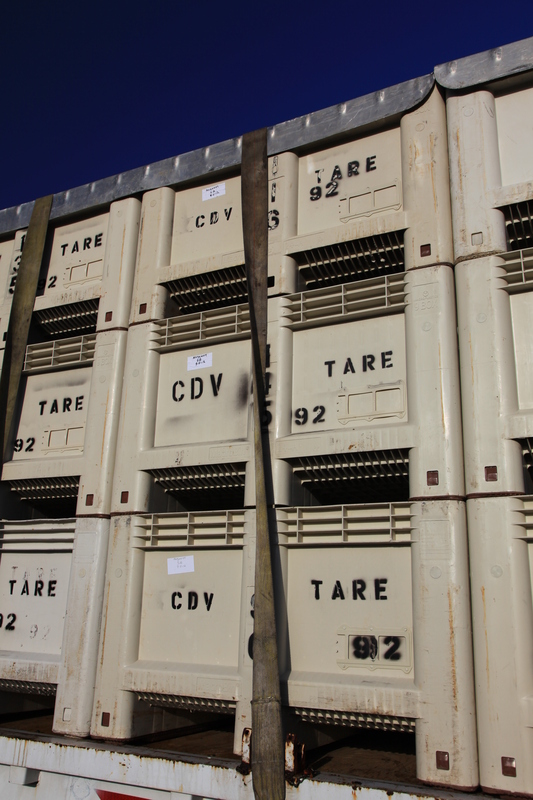 But soon we were back in Carneros, and we unstrapped the 48 bins. Rather than wait for them to be unloaded, we unhitched the truck from the trailers and drove it to the other side of the parking area, where Ron had left another set of double-trailers the day before. This set had 11 empty “Valley Bins” on them, and Ron quickly latched the Peterbilt to the lead trailer. Once again we were headed back through town and down the Trail, but this time went past Clos Du Val to Regusci, where we would drop these bins off. Ron helps RJ unload the valley bins at Regusci. 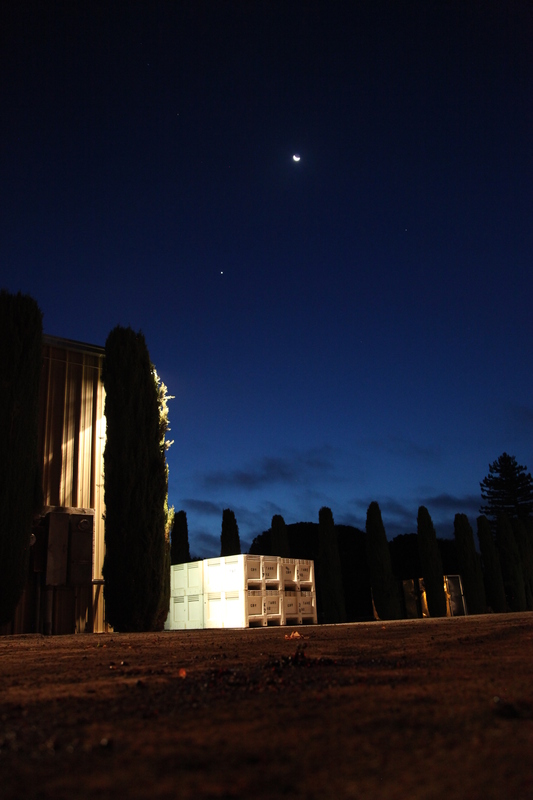 Next we returned to Clos Du Val next door to pick up the remaining 24 empty bins to take back to Carneros for the next day. More forklift and strapping action ensued. While this happened, I watched the CDV crew crush the grapes we had hauled over a few hours before. The smell of the freshly processed juice was intoxicating, and a joy to behold. Soon this smell will permeate the entire Napa Valley, and I will smell it in my driveway. That’s when I know harvest will be in full swing. economics of making wine. (Some of what I learned I won’t post here, because the numbers may be confidential, but I learned a lot about how much a winery can invest in new barrels each year, and how much they can make from selling excess fruit.) 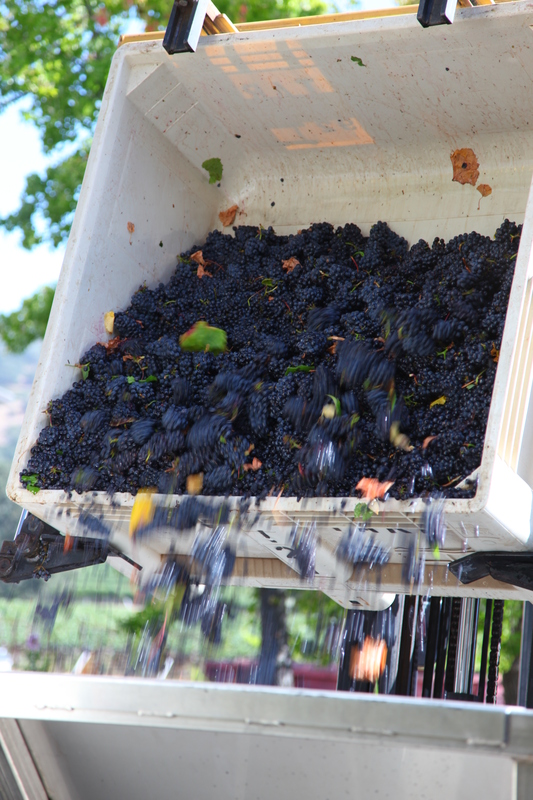 Harvest happens when winemakers and vineyard managers determine the fruit is ready to be picked. 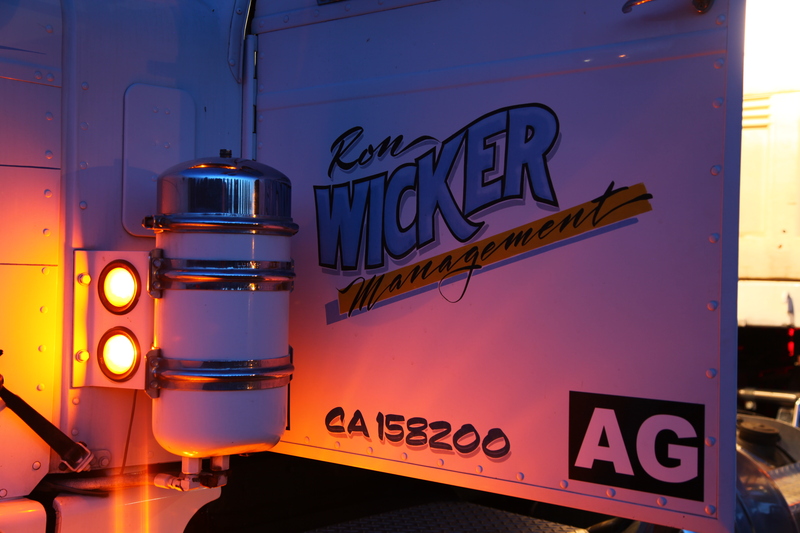 And when they decide that, people like Ron Wicker spring into action. The timing is somewhat unpredictable, and the details change by the hour, but everyone I encountered was relaxed and calm and extremely good-natured about the whole thing. It’s the wine business, after all! This entry was posted in Napa, People, Wine. Bookmark the permalink. Your posts are great. How’s this business going for you? Can I get involved? And, by the way…..great photos. The early morning light makes for stunning shots.